You know, my daughter’s name is Allison. She loves to hear all about my Chicks with Ticks adventures. She especially likes it when I relate an exciting story and later she and I share a similar experience. I am proud to hear that she wants to grow up to work with animals and possibly wildlife in particular. She likes to get dirty, but appreciates bright nail polish. She is the epitome of who and what Chicks with Ticks stand for. 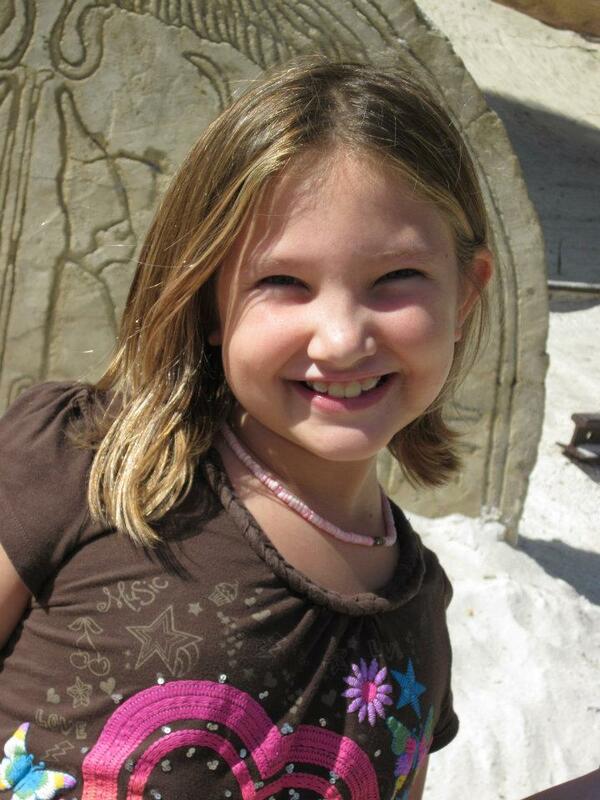 I thought it would be interesting to interview her and ask a nine-year old young lady what she thought being a Chick with Ticks was all about and how she felt about me blogging while she swims in the pool at the hotel on our Venice, Florida vacation. I was pleasantly surprised, a little taken aback, and somewhat humbled by her responses. What I thought would be a cute filler about my daughter turned into an eye-opening exchange that made what I do here much more than just “filler”. I first asked her what she thought of being a CWT. She quickly did a backflip in the pool and answered that she thought it was cool that you can be funny and naturee. She remarked that it is cool that you can be any age to be like naturee and do outdoorsy stuff. You love that you can be any age and be a scientists. I asked her what her wildest adventure was. She recalls going to Tennessee to visit my parents last year. She liked that we hiked the waterfalls as a family. She remembers hanging over the ledges and the forest being so beautiful. Her other favorite was caving. She has a friend Rhiannon, and together they create fairytale places in the Withlacoochee forest while we hike and find lime caves to explore. I asked her who is a Chick with Ticks. She tells me she gets dirty. She doesn’t care what other people think of the outdoorsy things she does. She takes risks and does things that others don’t understand the reason for. Chicks with Ticks are beautiful because they care about our earth. Being a daredevil and taking risks is exciting and makes them amazing – “Like You!” She said to me. 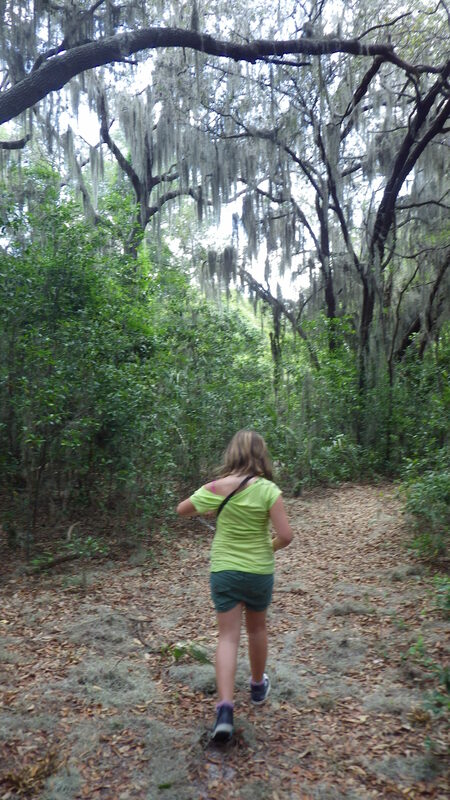 Off on an adventure…..Allison heads into the forest. I guess this wasn’t just filler….and, Allison, I hope that one day I inspire even one person to go out and have an adventure. Even if I never hear about it – it will be amazing. Available in limited quantities, the newest 2012 shirt will have the “fancy” logo and will be hand dyed with natural Florida materials (berries, leaves, clays, etc.). These will only be available for a short time so order now! The decals will be offered too. Just check the right side of this page and go to our handy-dandy online store now! Do you have a suggestion for a product you want? Let us know here! We can GO ANYWHERE and so can our logo. Thanks for visiting. Well, in the beginning, we really had no idea what we were doing. At least not as it related to surveying. We understood the basic principle but hadn’t really done it right in the field. John wanted to survey a particular stream that he had worked on for another project. Can’t say the name here so we will call it Moon Bay. John was in a very good mood (at least for now). We parked, and proceeded to the stream to find a reach to survey that represented the “natural” system. Funny thing about Florida, there probably aren’t any truly natural systems left. It’s actually a sad thing. You go miles into the wilderness and voila’ there’s a balloon on a nylon ribbon – deflated and sad-looking – ruining the wildness – making fun of it. Anyway, John found what he wanted and we began moving up and down the system flagging each place for survey. John has a back issue sometimes. 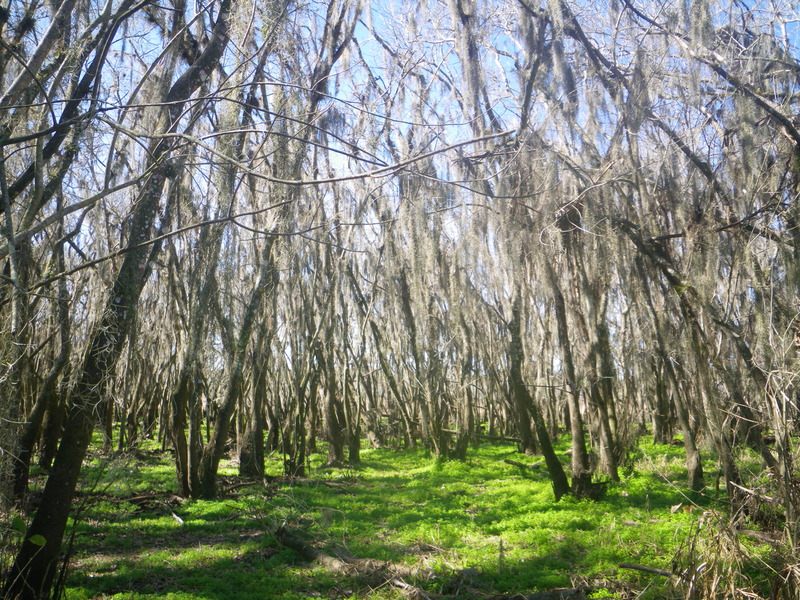 We were ducking under a lot of trees that had fallen over the stream in the last big round of hurricanes in 2004. He began to lose his sense of humor – this same sense of humor which has us in stitches most of the time. We finished flagging the reach and went to get the survey equipment. Kristen and I had practiced and thought we pretty much knew what to do. We set up our temporary benchmarks (we are not surveyors so it’s all temporary). We began to shoot the stream survey. John continued to lose his sense of humor. It was hot, uncomfortably messy, vine ridden and lots of ducking and climbing. I remember Kristen and I thought how awful this site was. 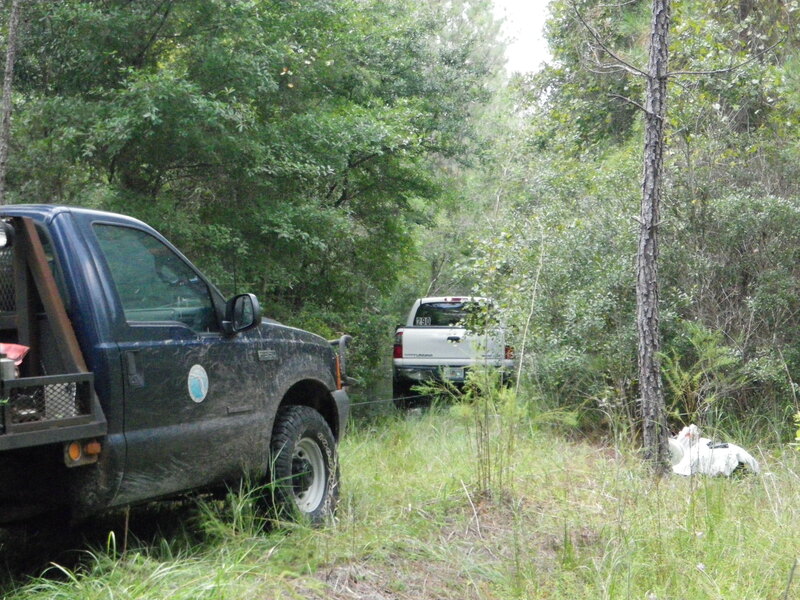 There was so much to go through, vines, palmettos, and underbrush. This was hell! Somewhere near the end of the reach, John checked the survey data. There was a problem. A serious problem. At some point someone had made a mistake and now the whole thing was useless basically. John was not happy. I was not happy. Kristen was not happy. This meant that, at some point, we would have to come back. The very thought of fighting this mess of vegetation was too much to bear. It made me wonder if i could really do this. I had no idea what the hell I was doing. I would never want to come and do this with just Kristen and me. This place was too wild. There were too many dangers. I wouldn’t be able to see her at some points in the survey. Would we ever get this right? It was all too much to even think about. We were mortified. I would and will never forget this day. I was sweaty and scratched to heck. I was upset and doubted myself. I felt like I had let the team down in some way by feeling this way too. I felt that I had wasted a chance to make an impression on John and Kristen too. How could this had gone so wrong? Now, it had to be done all over again. The fear, the stress, the pain, the risk of busting the survey again…..it just seemed impossible to bear. It was going to be hard to make myself do this again. This was horrid. I hated the way I felt – DEFEATED. 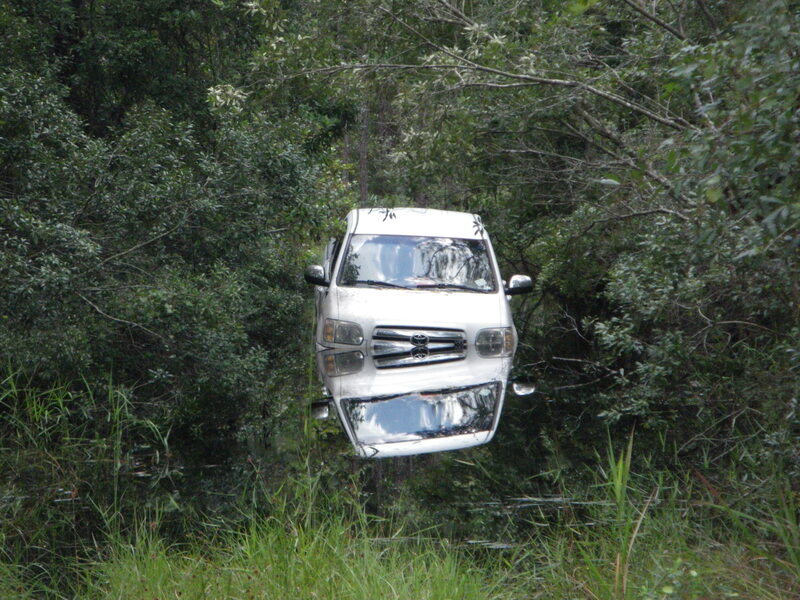 Lesson 3 – How to cross a flooded creek or – I think the truck is floating! Yes – that’s right, sometimes you have to go where no man or Chick with Ticks has ever gone before. And, out in the woods, there isn’t always a path. 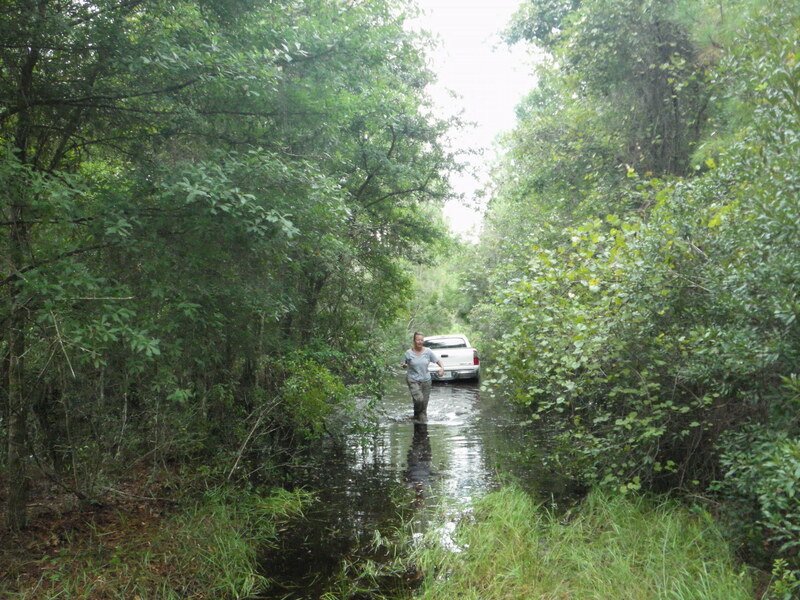 Oh sometimes you get a path but there is something that makes using it a bit challenging…like a creek…in the wet season…in the Florida swamp! Well, Chicks with Ticks don’t let that stop them. No! In the event that you find your path heading straight across water “of an unknown depth” (a popular safety meeting topic line), you should probably know a few things before you try to cross it. Have you done this before? If the answer to this is no – DON’T DO IT! (although you might still) If yes, continue to question two. Is your vehicle four-wheel drive? If not – DON’T DO IT! If yes, proceed to the next question. How deep is the water? Now, there’s only one way to find out for sure. Oh, you may see a gauge with numbers on it – I wouldn’t rely on that one totally. You have to get out, grab a stick or pole (trusty yard stick works every time). Walk back and forth across the path until YOU COMPLETELY HAVE AN IDEA OF THE ENTIRE PATH’S DEPTH. “Jacque, why are you shouting at us?”, you might say. Well, I happen to have a lot of experience in doing it both right and not so perfectly right. The important thing to note about the depth is – will it float or flood the truck? If it will – DON’T DO IT! If you are not sure – DON’T DO IT! If not – keep going….at your own risk! What is the bottom like? If the bottom happens to be mucky, slimy, silty, organic (debris), or anything other than good old sandy dirt – DON’T DO IT (unless, of course you have done so before and are willing to suffer the possible consequences)! If it is good old sandy dirt – onward ho! Are you willing to get across without stopping, chickening out, listening to squealing field partners, risk the worst case scenario (floating or flooding), and just go for it? If not – DON’T DO IT! Floating without flooding is a skill! Did you make it? If not – hope you have a few boards, a winch (not wench), some rocks, or a friend to call, like we did. If so, congratulations, you will now want to cross every damned creek you come to and even some wet rivers! Enjoy it. I hope you will keep in mind that safety is always first – but fun actually comes before safety so is easier to come by….combine the two and it makes everything more fun! And, we all know it is fun out there! Chicks with Ticks GO ANYWHERE! As an added note: do not enter water that is flowing too quickly, is too deep, is filled with alligators (oh -we do that, nevermind) or otherwise poses a threat to you – a vehicle can become a death trap in water and it is no joke….please follow all safety recommendations. 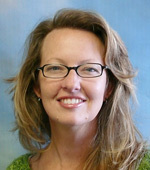 I was in grad school and my advisor told me I would be doing my research assistantship with this PhD student/big shot department head at some engineering firm in Lakeland. This big shot, John, was going to be in Gainesville the next day to meet me. So I rolled out of bed, hungover (those were the days! ), and met John for the first time. This meeting turned out more like a job interview, a really long job interview, with John reading down my resume and going on and on and on about some project. Luckily for me John didn’t notice I was hungover (or didn’t care) and decided to give me the job! I later found out that John’s only real hiring criteria was to make sure I wasn’t some girly girl who would be SCARED to do the job– a job that all the talking in the world (and John can talk ALOT) could have NEVER truly prepared me for. But the way John spoke about the project, like Jacque, I felt that I could do anything with this guy at the helm. You see, you don’t often meet someone so passionate about something, and his passion for Florida streams was utterly contagious! He rattled off a list of people who I would later meet when I came down to Lakeland, none of the names which I remembered by the time I made it down there a couple weeks later. This doesn't look very fun! Are you wearing Chicks with Ticks gear? Well, it’s official. The first batch of Chicks with Ticks gear is available online. The brand has been a part of my life for over four years now. You can’t imagine how amazing it is to see it become a reality! From a hokey hand made t-shirt to wear in the field to a full line of gear and flare, I am so excited. My challenge is still on – first person to post a photo of them wearing REAL Chicks with Ticks logo gear from our online store wins Lemon Drop Shots from me – that’s right! Come on you guys….get some Chicks On!!! 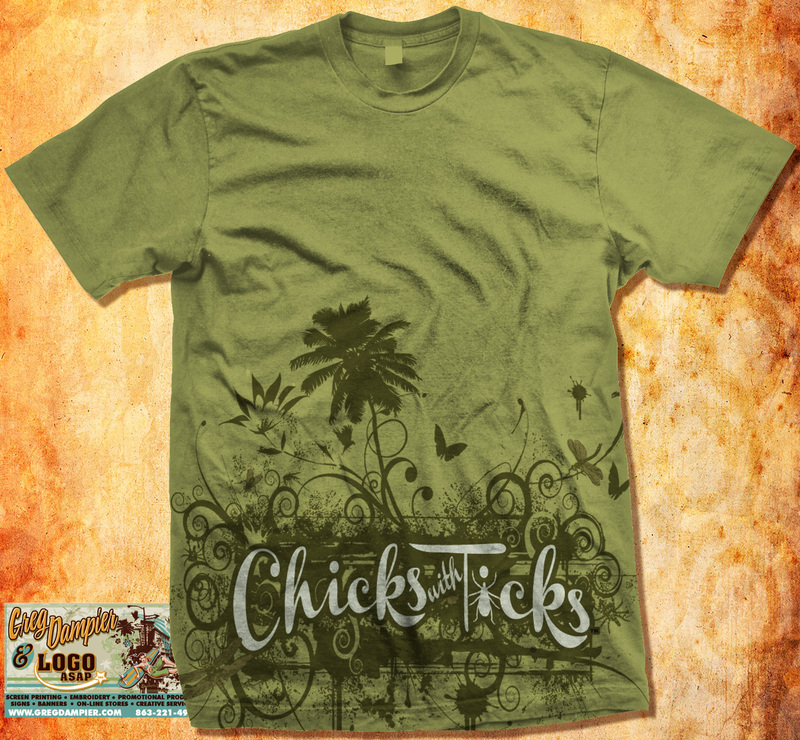 Don’t feel left out boys…..Guys Love Chicks with Ticks gear is available with more coming soon! 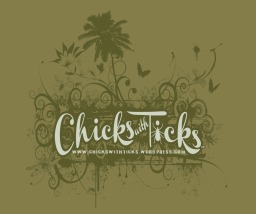 Chicks with Ticks Gear Available Now! So, John was wildly busy. Kristen and Jacque are awaiting his instructions….”what is it we are supposed to do?” we said. Well, I will tell you right now, those of you who know us personally know this – we don’t wait around!! We are take charge kind of gals. We decided to start going to these remote sites, and decided we would figure it all out in the field. How hard could it be? We had maps! After all, we knew what it was we were supposed to gather. We knew where (ha) and we knew we were behind schedule already. 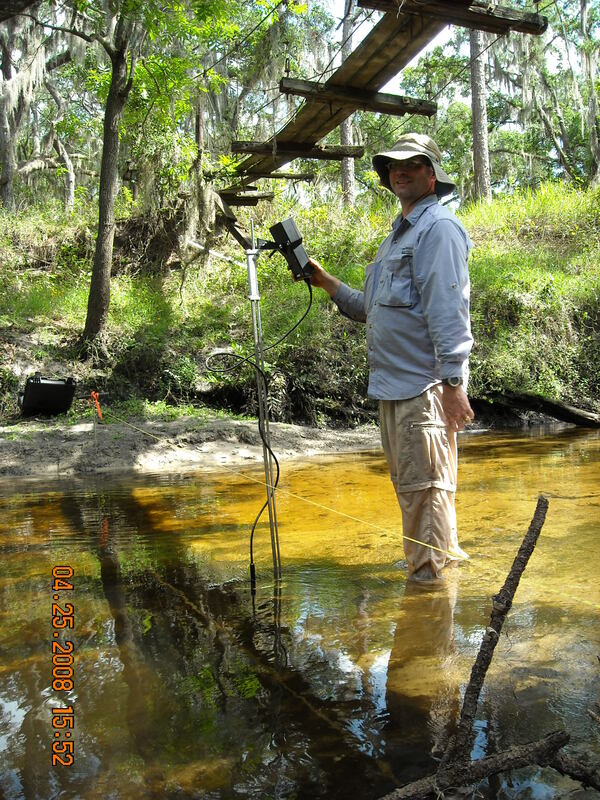 So off we went into the Florida wilderness to collect stream data and begin a five year adventure of a lifetime. In the beginning, it was our job! I have to stop and admit – at this point in the story – things will be posted here as Adventures….but in reality, they weren’t all adventures. Just like an edited show, some content won’t make it here. There were days that you will never hear about. There were tears you will never see shed, laughter you won’t hear ringing in the forest, and fear you won’t smell as we sweat – we left a lot of ourselves out there for some other brave person to find. I can’t make you feel the way we felt standing there, scratched to hell and cursing. I don’t have the courage to type words that came from our hearts and souls. Instead, friends, I will give you a taste of the beauty and laughter two strangers found out there in the middle of nowhere. And it all starts right here. It starts on this blog born from a loss so personal that no one will ever understand. The pain of losing a part of myself is what sparked this blog. You see, in the beginning, it sounded like a job we would enjoy….but in the end, well, in the end we found out what the price is for being truly happy in your work. Trust me, I have paid the price. Enough of that – let’s start the Adventures!!! Do not look forward in fear, but around in wonder. Little Chicks in the making….. I have had the most amazing experience. All Chicks live to share what we love with others. It’s just natural that I should want to share my sharing with all those out there so – here goes…. I received a call from the dance studio owner where our daughter goes to afterschool. She was frantic. Her 12 year old daughter had chosen a science project and needed to find and identify 25 native tree species – BY THE MORNING!!! She immediately thought of me as she is very familiar with my muddy snake boots, spidery hair, and general smell from the field when I come to pick up our daughter. She knows what it is I do and felt I was the person for the job. We jumped in the expedition and began our expedition!! Off to find 25 tree species, collect perfect leaves, and teach said future Chick to identify them! We hiked through bidens, ceasarweed, mud, maidencane and general weeds. We pulled branches, braved mosquitoes, and sweated. I waded in a local swamp for pop ash. We collected, I taught, we collected, she marked the list, it was four Chicks on a Sunday adventure! We collected and taught until she had everything she needed to complete the project ON HER OWN!! Her mother then turned to me….and said….”That was amazing. Do you still want to do this for a living when you grow up?” and she said “More than ever now.” I was thrilled – you can only imagine my smile. I want you all to know that my daughter had tagged along on this adventure – smiling and sweating right alongside me just like always – only in shorts and little black babydoll shoes! Sounds like a great afternoon huh? It got better!! Yes – her mother then informed me THAT THIS WAS HER DAUGHTER’S FIRST TIME WALKING IN THE WOODS!!!! Let me tell you all that I have never felt so good!! This young woman had already chosen a path into the muddy, buggy, crazy world of Chicks With Ticks – she knew she wanted to be out there – BEFORE EVER HAVING DONE IT! Let’s all raise our beers to the two young woman and grown woman who joined me in the forests and wetlands that brought one more Chick to the family! I have never been more proud to be a Chick With Ticks!!! Move over swimsuit models....we have real Chicks coming through!! !